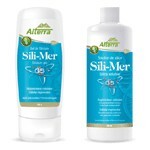 Sili-Mer G5 regenerates, strengthens, and protects our cells from the inside-out. Silicon is one of the four components essential to the structure of our connective tissue (skin, muscle, tendon, and cartilage) as well as our bones. Although we can acquire it from some foods, organic silicon can also be derived from the surface of grains, or amorphous sand, where specific bacteria secrete an organic acid that acts on a superficial layer of silicon. Due to this action, the bacteria can harvest a significant amount of organic silicon, particularly natural silanols. Sili-Mer G5 will not only give you radiant hair, skin, and nails, but also support your immune system and draw out pollutants at the cellular level. It is available here either as or oral solution or a topical gel.